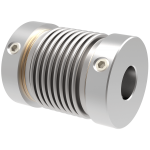 simple installation, with EASY-Clamping hub on both sides6-corrugation bellows - cost-effective standard seriesTorque range: 20 - 1.300 NmShaft diameter: 9 - 85 mm..
simple installation with radial EASY-clamping hub on both sides4-corrugation bellows - short design - high torsional stiffnessTorque range: 20 - 900 NmShaft diameter: 9 - 75 mm.. 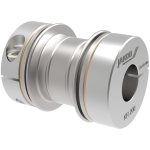 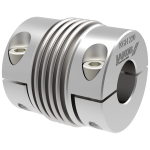 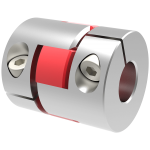 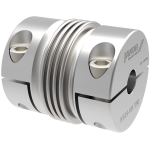 Simple installation with radial EASY-clamping hub on both sidesStraight bellow - long designLow restoring forces – high torsional stiffnessTorque range: 25 - 1.500 NmShaft diameter: 14 - 89 mm.. 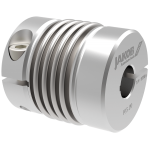 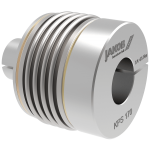 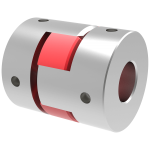 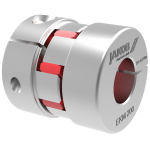 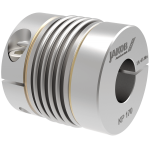 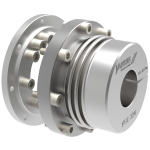 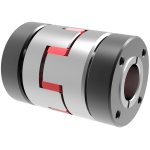 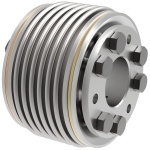 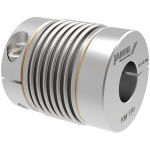 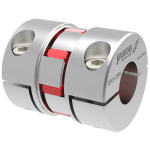 Simple installation - now also with splitted hub design on both sidesStainless design - variable lengthTorque range: 10 - 400 NmShaft diameter: 6 - 55 mm.. 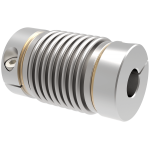 Simple installation with radial EASY-clamping hub on both sidesSteel hub - welded design - temperatures up to 350°C4-Corrugation bellows - short design - high torsional stiffnessTorque range: 40 - 1.8..
Steel hub - welded design - temperatures up to 350°C4-corrugation bellows - short design - high torsional stiffnessTorque range: 30 - 1.000 NmShaft diameter: 11 - 90 mmStainless steel.. 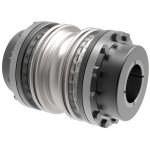 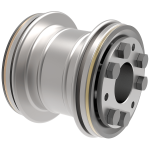 Simple installation - splitted hub design on both sidesSteel hub - welded design - temperatures up to 350°CCustomized length with 2- or 4-corrugation bellowsTorque range: 20 - 1800 NmShaft diameter: 6.. 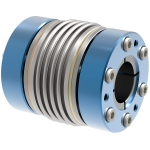 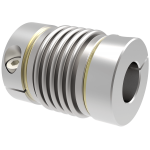 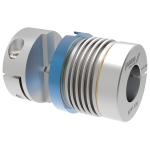 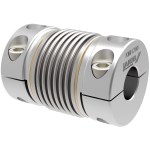 Simple installation - split-hub designWear and maintenance freeVariable length stainless steel version up to 350°CTorque range: 10 - 1.200 NmShaft diameter: 7 - 85 mm..
conical hub on both sides6-corrugation bellowsTorque range: 10 - 4.000 NmShaft diameter: 6 - 102 mmcost-effective standard series..
conical hub on both sidesstraight bellow - long designTorque range: 25 - 2.500 NmShaft diameter: 10 - 102 mmlow storing forces – high torsional stiffness..
Torque range: 4.000 - 50.000 Nm3-parted construction- easy to fit - variable in useflange hub or conical ring hubShaft diameter: 70 - 220 mmbacklash free – exact torque transferhigh torsional stiffnes..
conical hub on both sides - aluminium design''high speed- version'' for a speed up to 30.000 rpmlow mass moment of inertia - high balance qualityTorque range: 15 - 600 NmShaft diameter: 6 - 60 mm..
for direct mounting in a hollow shaft4-corrugation bellows - short designTorque range: 2 - 600 NmShaft diameter: D1: 3 - 68 mm / D2: 8 - 48 mminternal axial buffer..
several hub variants with a backlash free nose groove principleblind assembly (plug in) possible - backlash freesturdy whole metal version for temperatures up to 200°CTorque range: 10 - 600 NmShaft di..
for standardized interface connection DIN - EN - ISO 9409 - 1two-part connection flange • compact designTorque range: 40 - 1800 Nmshaft diameter: 12 - 90 mmsimple installation with radial EASY-clampin..
radial clamping hub on both sidescost-effective, very short design, standard seriesplug in, backlash free, oscillation dampeningTorque range: 8 - 2.000 NmShaft diameter: 8 - 90 mm..
conical clamping hub on both sidesrotary symetric design - high speedplug-in, backlash free, oscillation dampeningTorque range: 10 - 2.000 NmShaft diameter: 6 - 85 mm..
simple installation due to split-hub designcan be combined with EKM - hub or ESM-A - hubmountable without disassembly of motorTorque range: 15 - 2.000 NmShaft diameter: 8 - 100 mm..
standard version with radial clamping hubhigh torsional stiffness - flexibleTorque range: 0,4 - 12 NmShaft diameter: 3 - 24 mmTemperature range -40 to +200°C..
short design – with radial clamping hubhigh torsional stiffness - flexibleTorque range: 2 - 12 NmShaft diameter: 3 - 24 mmTemperature range -40 to +200°C..
low-cost version with set-screwhigh torsional stiffness - flexibleTorque range: 0,4 - 8 NmShaft diameter: 3 - 24 mmTemperature range -20 to +90°C..
simple installation with optional radial EASY-clamping hub on both sidessteel hub - welded design - temperatures up to 350°C4-corrugation bellows - short design - high torsional stiffnessTorque range:..
steel hub - welded design - temperatures up to 350°C4-corrugation bellows - short design - high torsional stiffnessTorque range: 4 - 15 NmShaft diameter: 8 - 20 mmstainless steel..
standard version with radial clamping hubplug in - oscillation dampeningTorque range: 0,7 - 12,5 NmShaft diameter: 3 - 14mmTemperature range -20 to +70°C..
low-cost version with set-screwplug in - oscillation dampeningTorque range: 0,7 - 12,5 NmShaft diameter: 3 - 14 mmTemperature range -20 to +70°C..